Disclosure: Los Tweens was provided with samples of Cookwell & Company products to try. All opinions and recipes are our own. Oh my, here it comes! It’s back to school time. No more lazy evenings where meals just come together on their own. Back to school for me means back to dinner planning. Cooking is my creative outlet. Dinner is my blank canvas and ingredients are my paint colors. No one dinner is ever the same in my house but flavors do repeat themselves. One of my favorite flavors that I have been having a hard time replicating is that of my grandfather’s sour orange pork chops. Sour oranges should be easy to find in South Florida but they’re not. A citrus tree disease left the sweet and sour oranges hard to find in our Miami backyards. Grocery store sweet and sour oranges are often pricey and past their prime. Cookwell and Co. sent me a sample of their Fin & Feather Marinade. The second I tasted it, I knew it was almost a perfect flavor combination to replicate that of the sour orange. Just sweet and just tangy enough to excite the taste bunds without being overpowering. 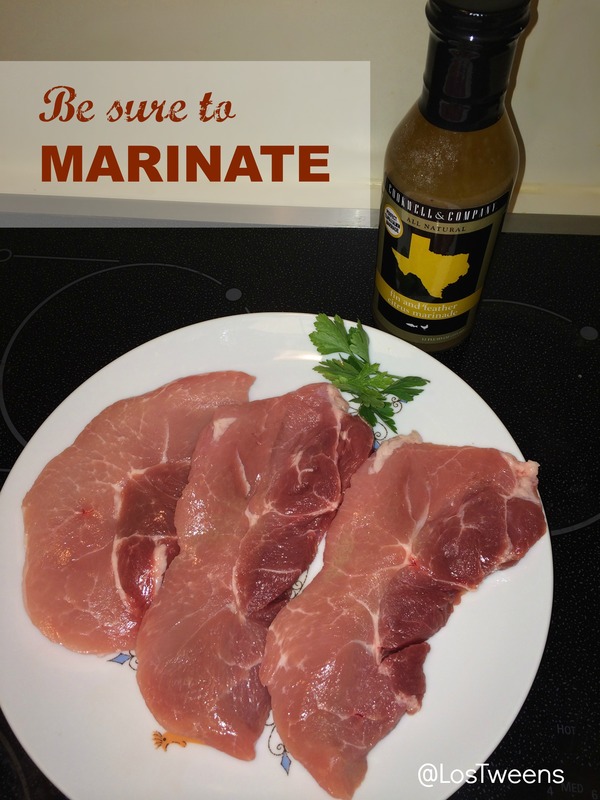 Marinate pork chops in 1/2 cup of Cookwell & Company Fin & Feather Marinade either overnight or for an hour. Heat a tsp of olive oil in a pan and brown both sides of the pork chops on medium-high heat. Once browned, set aside and move on to next step. Add a tsp of butter and the onion slices to a pan set on medium-low heat. Allow the onions to cook until they become translucent. 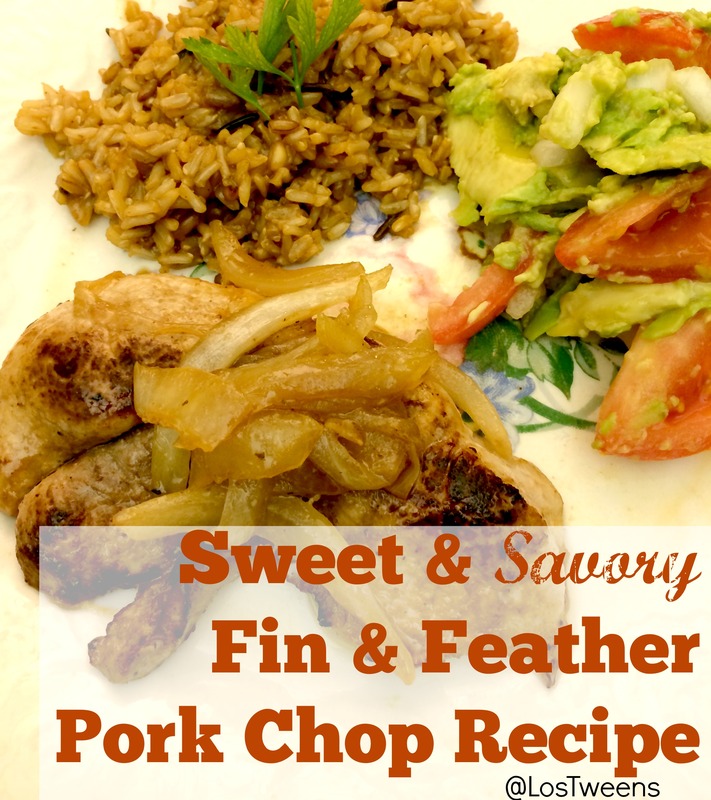 Add the pork chops back into the pan and pour 1/4 cup of Fin & Feather Marinade on top. Cook for 5 more minutes or until pork is cooked to desired temperature. Serve with wild rice and an avocado tomato salad for a perfect meal your family will enjoy. This entry was posted in Recipes and tagged back to school, cooking, Cookwell & Co., easy recipe, pork chops, recipe, sweet and sour. Bookmark the permalink.